‘it’s all about …’ trilled the perky, lower case script, ‘gaylen gerber!’. 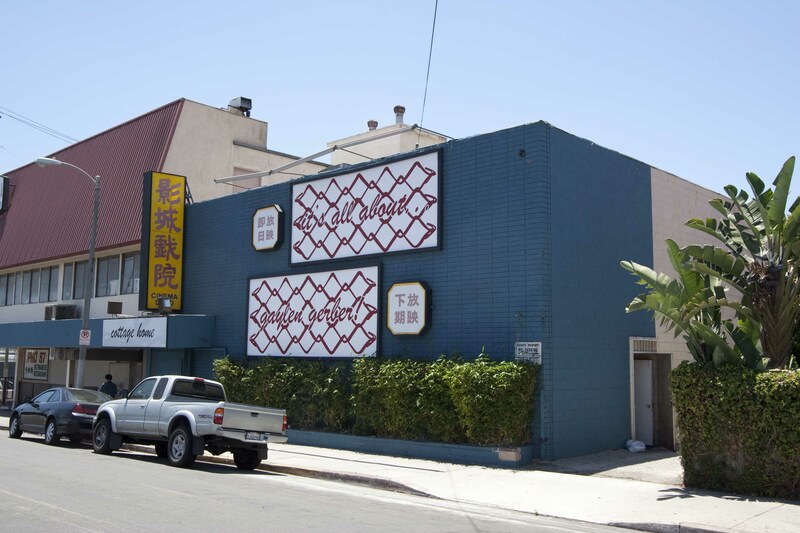 The text ran across two billboards affixed to the exterior of Cottage Home, the former cinema that has served as a project space for three commercial galleries: Kathryn Brennan Gallery, China Art Objects and Thomas Solomon Gallery. For what it’s worth, ‘Support Group’ took place at the instigation of the latter, although Solomon’s contribution seems to have been limited to inviting critic Michael Ned Holte to curate the show, which featured none of Solomon’s gallery artists. This was just the first sequence in a complicated game of authorial ‘pass the parcel’, in which no one, it seemed, quite knew who would be the one with the package in their hands when the music stopped. Of the three artists selected by Holte to contribute to the show – Gaylen Gerber, Kathryn Andrews and Matteo Tannatt – one invited 15 additional artists to join in, one used two other artists as content for her work, and one almost refused to show up at all. This last, Gaylen Gerber, was the subject (or at least the content) of the two-part billboard on the front of the building, itself an art work by Andrews simply titled Gaylen Gerber (2010). Andrews laid her script over a pattern resembling a chain-link fence, fleecing its devil-may-care, retro decorativeness with an oppressive sense of urban restriction. The work came into new focus once inside the main gallery. Andrews had sectioned off the lion’s share of the space with an actual chain link fence; it offered no entrance, so visitors were forced to move only around the edge of the room. Inside the sealed compound (titled Friends and Lovers, 2010), two white-painted, breezeblock walls faced each other, with identical cartoon animal heads painted on their inner aspects. The animals (chipmunks? bears?) are apparently the trademark of a downtown graffiti artist; the practice of anonymously inscribing a more or less arbitrary signature across the public realm for an involuntary audience chimes discordantly with Andrews’ aggressive modes of occupation and ownership. Gerber, meanwhile, seemed nowhere to be seen. Those familiar with his practice, which often includes backgrounds against which he displays his own or other artists’ work, might have noticed that three of the gallery’s walls were painted a pale shade of grey. This, coupled with the alteration of the gallery’s strip lights to a particularly cold and sickly wattage, was the total of Gerber’s contribution. No entry for the artist was given in the list of works. In his introduction to the show, Holte states that he deliberately placed it within the power of the artists to negotiate the form of the exhibition and their collaboration (or lack of it). In the light of Andrews’ provocative use of Gerber’s name on the exterior of the space, it is tempting to imagine that a frisson of antagonism had sparked between the artists in the run up to the show. Alternatively, owing to Gerber’s sensitivity to the subtle shifts capable of subverting obvious attributions of authorship, it is highly possible that he realised that an ostensibly neutral grey background was all that was needed to unbalance Andrews’ boisterous graphic signage and chain-link barrier. The show was dramatically up-ended in other respects too. While Andrews’ and Gerber’s work demonstrated a paradoxical aesthetic restraint in its (almost total) occupation of the space, on the far side of the room Tannatt had pitched a dense encampment that was more or less contained within three sheets of chipboard. The boards – standing proud of the gallery wall on a metal armature – were in fact an art work by Tannatt titled Monster Model: Blue Screen Version (2010). On, beneath, beside and behind this temporary wall were installed works by a host of other artists at Tannatt’s invitation, as well as examples of his own solo and collaborative work, in reference to the programme of Pauline, the idiosyncratic gallery he runs in his flat (its name a tribute to a local prostitute). While aesthetic coincidences bounced between this selection – as with Lisa Williamson’s untitled photograph of dangling avocados and Alex Klein’s photograph The Brick and the Balloon (2010) – it delivered no obviously legible message, but rather seemed to reflect the subjectivity of private conversations, social allegiances, and personal taste. Tannatt’s application of blue-screen paint over Monster Model… – or at least the parts that he could reach without using a ladder – drolly illustrated the absurdity of his pretending to be absent. In actual fact, for much of the show, the artist was very much present, using the gallery’s upstairs room as an office for Pauline Film Production Co. which, we were told, was ‘planning and possibl[y] making’ a ‘video and/or film to be completed or in progress by the end of the exhibition’ that engaged with or borrowed from the other works in the show. There was no way of knowing whether the artist kept to his word; the office was out of bounds to visitors. In contrast to the phony generosity of much current collaborative practice, Tannatt, as with Andrews and Gerber, kept his cards refreshingly ­– and honestly ­– close to his chest.